PICTURED ABOVE: Senior Art Exhibition was an incredible success - art students were busy all night discussing their art with guests. As a special service for our Red Carpet Gala attendees, LJA is offering complimentary transportation to and from LJA and The Pacific Club. 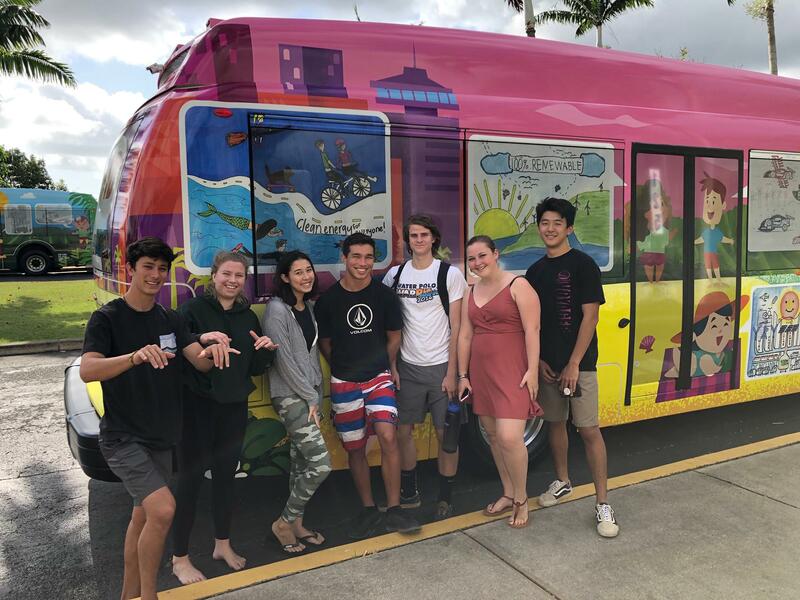 The electric bus that features art from two of our students art will be transporting guests. Be one of the first to ride the new bus and enjoy a drive-free evening to the Gala. Interested riders, please fill out the Gala transportation form. Details regarding pick-up and drop-off times will be communicated once the sign-up is finalized. Don't miss out, get your ArtsFest wristbands and t-shirts! All orders must be received by April 20. 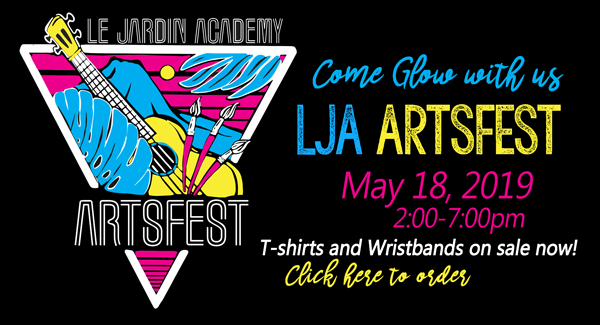 Wristbands and t-shirts will be delivered to students the week of ArtsFest. For more information and to place your order, click here. The theme of this year's May Day program (K-8) is "Ka huaka'i 'imi 'ike," which means "the journey to seek knowledge." Students will be exploring mele and dance that highlight the importance of our learning, not just in traditional spaces, but honoring spaces where learning can happen, as well as valuing what we learn. We are accepting foliage to decorate for the May Day program. We need: Ti (stalk or individual) Monstera, Laua'e, Areca Palm, Raphis Palm, small Loulu Palm, Song of India and tropical flowers. Please drop off donations beginning April 29 outside of the Administration building. Volunteers also needed to help with décor on April 30. To volunteer, contact Kara Omori. The ordering deadline for Project Grad's May Day lei sale is April 22. To place an order, click here. Elections are coming soon for the 2019-20 PFA Executive Committee. Nominations are still open through April 15. Please use the nomination form to apply. Elections will be held on April 18. Meet the Boys Intermediate Volleyball DII champions! Congrats Coach Lee Lamb and the team: Vincent, Reid, Jordan, Bronson, Terrin, Myles, Kainalu, Connor, Raymond, Abraham, Noah, Shore, Kameron and Alika! 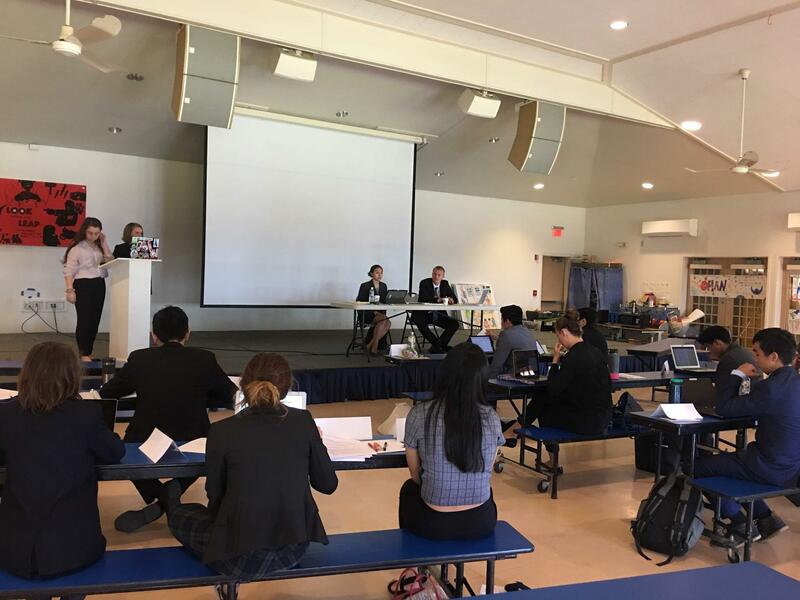 About 50 students from Iolani, MidPac, Kamehameha, Hanalani, Saint Andrew's Priory, and LJA worked on two committees at LeMUN: Food Insecurity in the Pacific and Human Trafficking. Keynote speaker was Jessica Munoz, founder and president of Ho'ola Na Pua, a nonprofit organization whose mission is the renewal of trafficked girls through health, education, advocacy, and reintegration. Congratulations to the LJA MUN club for working diligently to make this event happen. And a special congratulations to Hannah who was elected Hawaii MUN League Deputee Secretay General. 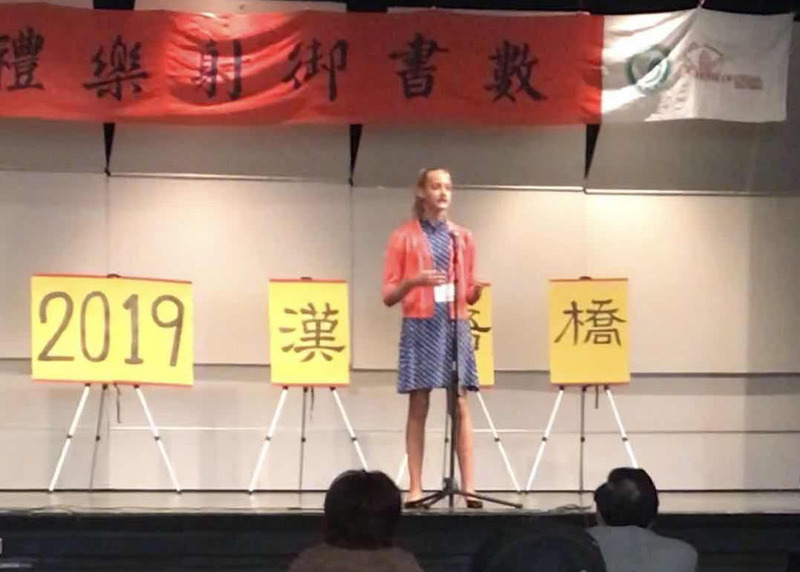 Congratulations to Aya '22 who represented LJA and Hawaii at the 2019 Chinese Bridge Chinese Language Proficiency regional finals in San Diego. Aya won second place in the high school competition, which is the highest a student from Hawaii has placed in this annual competition. Ke'alohi entered LJA in Grade 2, and has taken advantage of everything LJA has to offer but has found her home in the robotics program. " I have participated in FLL, FTC, and FRC Robotics and have been team captain at each level. I've really enjoyed watching the programs grow over the years. This past semester, our FTC team won the state championship." Ke'alohi says that computer science is hands down the highlight of her academic life at LJA. "The CS classes have led me to what I want to do for the rest of my life: cybersecurity. Activity-wise: robotics, 100%! I have been through the trenches with various coaches, members, and supporters, but have come out a better person, robotics member, and leader." Ke'alohi recalls the Grade 4 Big Island trip and the Grade 8 Maui trip as "off the charts, I don't think I've ever laughed more." Ke'alohi will be attend Embry-Riddle Aeronautical University in the fall to study Cyber Intelligence and Security. "I'm also interested in a possible double major in global relations and a minor in Spanish." She chose Embry-Riddle because of the incredible facilities, the small campus, and the small town vibes in Prescott, Arizona.